← Review of Blend Off! 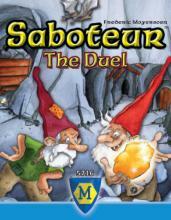 In Saboteur: The Duel, two players play as competing Dwarves, trying to get the most treasure out of the cavern. In the game, each player has a starting card, and then space is left for path cards to be played. Starting four card widths away from the start cards is a pyramidal arrangement of goal cards – these are the cards that hold the gold which the dwarves seek. A deck is created from the 34 path cards and the 18 action cards. There are four dwarf counters of each color available in each round. Each player is dealt a hand of six cards. Starting with the Green Dwarf, players will alternate turns until one of the round ending conditions is met. The game is played over three rounds, and the player with the most gold at the end of those three rounds is the winner. On your turn, you have four main options: play a path card, play an action card, discard 2 cards to remove a sabotage card or pass and draw. To play a path card, you take a card from your hand and play it adjacent to a previously played card on the table. When you play a card, it must have an uninterrupted connection to your start card. The goal is to connect your start card to any of the six goal cards – if you make a connection, you flip the goal card over to reveal it. 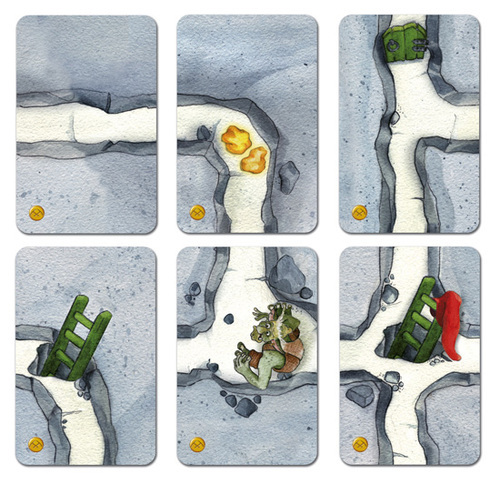 All of the paths must match the other cards on the table, and the card must always be played in the upright orientation. Some of the paths have colored doors on them – these doors are locked for the dwarf of the matching color. Some of the paths also have trolls on them, they can be bribed (by placing one of your four dwarf counters on it) and then paying a card with at least one gold nugget on it at the end of the round. If you manage to connect your start card to a card with gold pictured on it – whether a Goal card or a regular path card, you can claim the gold on that card by placing one of your dwarf counters on it. After you play your card, draw a new card from the deck. There are a number of different types of Action cards. There are sabotage cards which are played in front of your opponent – who cannot play path cards into the maze until they remove the sabotage card. There are repair cards, each of which fixes a specific type of sabotage. If you play the correct one, you discard both the repair card as well as the sabotage card in front of you. There are some key cards which can be played to unlock a door on the map. Place a key token of your color on the door to show that it is unlocked. Rock slide cards are played and then allow you to remove one card from the maze (though not start cards, goal cards, troll cards or any path cards with gold on them). After you play your card, draw a new card from the deck. You might choose to discard 2 cards from your hand. When you do this, you may discard a Sabotage card which is played in front of you as well. However, you only draw one card after taking this option, so your hand size will be reduced by one for the rest of the round. Finally, you can choose to pass. When you do so, you discard one or two cards from your hand and draw a matching number of cards from the draw pile. If you ever need to draw a card and the deck is exhausted, you simply do not draw. The round continues until one of the three round ending conditions is met: all the goal cards are face-up, all the dwarf counters have been placed, or the draw pile is exhausted and all players are out of cards. Now, you collect all the cards with gold on them that you have marked with your troll markers. They go into your score pile. If you have any markers on a troll card, you must then discard cards to pay the toll – one gold nugget per Troll from your score pile. Trolls do not make change, so use the smallest possible card to pay the troll. Play two more rounds, each time using the same setup – taking 6 Goal cards from the supply. By the end of the game, you will use all the Goal cards. The supply of tokens (dwarf and key) are renewed each round as well. The player with the lower score goes first in the second and third rounds. If there is a tie, the blue dwarf goes first. At the end of the third round, total up all the collected gold nuggets. The player with the most gold wins the game. No tiebreaker is specified in the rules. I should start by saying that I’m generally not a 2p gamer. My game groups usually have 4 or 5 players, and it’s rare for me to pull out games for only two. That being said, I was able to get two games of this in – and it’s a decent game. There is a nice ebb and flow in the game – you are trying to build your own pathways while also trying to prevent your opponent from building his. The main weapons that you can use are the Sabotage card. A well played Sabotage card can disrupt your opponent’s plans. They either have to take a turn to play a Repair card (assuming that they have the correct card) or they have to discard two cards and reduce their hand size in order to get rid of the Sabotage. Unlike some other 2p games, notably Milles Bourne, you do not have to wait for the right card in order to move on – but losing a hand card can be painful. Some rounds can get interesting when the two players merge their paths. When this happens, both players can play off the common path – now, the cards with the doors on them as well as the trolls seem to be the better obstacles. Timing is key here – you want to slow down your opponent at the crucial moment so that you can beat them to a goal card. The game comes in the standard Amigo card game box size, and it’s just the right size to fit in your pocket to take along with you for games. The decisions aren’t overly complex, but starting with a hand size of six cards does give you enough options to feel like you’re affecting the course of the game, not just playing a card wherever it happens to fit. So, while I generally don’t play 2p games, this has been a nice change of pace, and certainly one that can compete for a spot in my backpack when I happen to need a game for two. I am surprised you enjoy this one, Dale. We found it to be a disaster. It was so easy to thwart each other by placing cards that would block the path or turn it in an undesired direction. We actually had several rounds where neither player reached a goal card. Yuck. Sabotage cards were very frustrating, as having the matching card to remove one was purely a matter of luck. Having to discard two cards to remove it left one with a smaller hand size for the duration of the round. There is simply WAY too much “luck of the draw” here.